"Tomatoes and cheese are piled onto slices of bread and broiled. Easy bruschetta that even tomato haters will love." Arrange the slices of bread in a single layer on a baking sheet. Mix together the olive oil and garlic powder in a cup or small bowl. Brush onto the slices of bread. 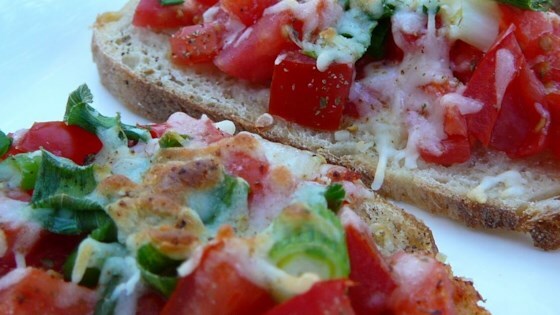 Cover each piece of bread with tomato slices, then sprinkle with as much cheese as you like. Drizzle just a bit of the olive oil over the cheese. Broil for 3 to 5 minutes, until cheese is melted and bread is toasted. Make sure you keep an eye on it - it doesn't take long! This is my favorite appetizer. You can change the cheese or add other spices. This is a classic! Thank you. This was amazing! We used pita bread instead of italian bread and it worked great. Very easy and delicious!